A tasty soya drink that combines a full and satisfying texture with a mild taste. And with absolutely no added sugars, it's healthy* just as it is nutritious. It’s what we like to call the well-rounded type. 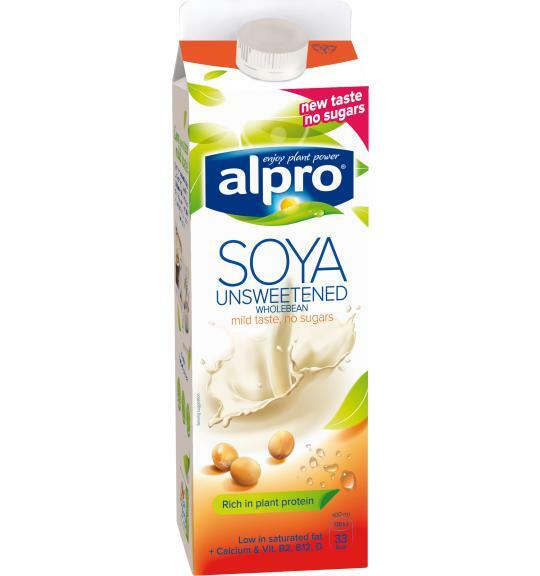 Its mild taste makes it brilliantly versatile, meaning Alpro Soya Unsweetened gives you yet another deliciously plant-powered option. Great for savoury sauces, soufflés and pancakes - or simply the perfect choice for those of us who are sweet enough already! *Source of protein. Protein contributes to the maintenance of muscle mass. A varied and balanced diet and healthy lifestyle is recommended for good health. A source of calcium. Contains vitamins B2, B12 and D.
Easy to digest as it is naturally lactose free & gluten free.